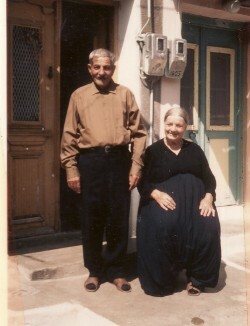 Above: My parents, Leonidas and Despina. Above Right: Walking along Plomari's promenade. L-R: Irini Tsakiri, Morfia and myself. Above: At the panygiri of Agios Georgios (Vatahti). 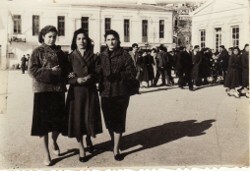 L-R: my mother, Despina, unknown (2), myself and Irini. 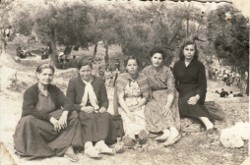 Above Right: Plomari, 1957. L-R: Irini Lagoutaris, myself, Mersini and, Zoe and my brother, Fotios- who were engaged at the time. Above: At my engagement party. 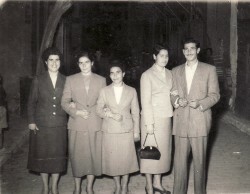 I am standing first from the left and next to me is my mother, Despina. 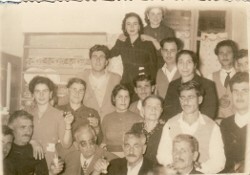 My father, Leonidas, is seated first from the left. Above Right: With my future sisters-in-law and a horiani. 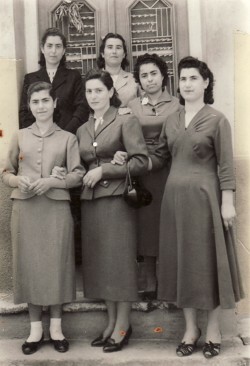 L-R: Persa (top), Theodora (front), myself (front), Maria (top), Myrsini and Irini. Above: With my husband, Dimitrios, and our children, Grigorios and Leonidas. We were traveling to Greece for a holiday at the time. 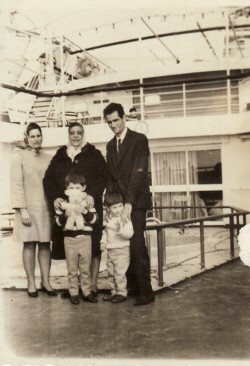 The other passenger (middle) is unknown. 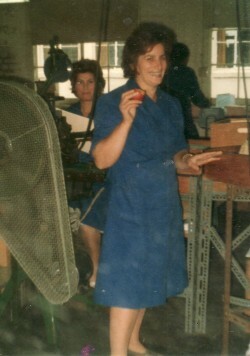 Above Right: As a worker in a printing company.